Hi Friends! Hope you are getting along with life pretty well. 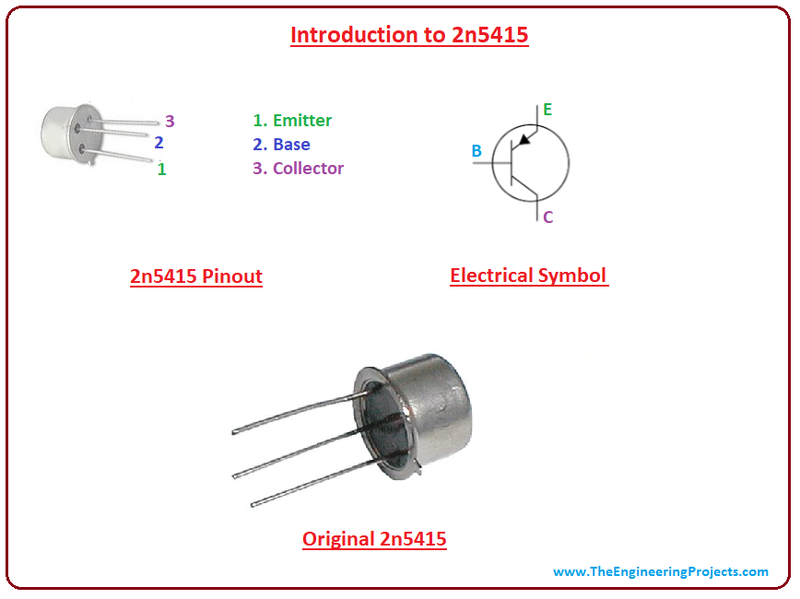 Today, I’ll uncover the detailed Introduction to 2n5415 which is a PNP transistor mainly used for general purpose low-power amplifying and switching applications. It comes with three layers: two P semiconductor layers and one doped N-layer where later is encapsulated between other two P-layers. There are two major types of transistor: Bipolar Junction Transistor and Unipolar Transistor. This transistor falls under the category of Bipolar Junction Transistor as it comes with two charge carriers i.e. electrons and holes where later are the major charge carriers in PNP transistors. In this post, I’ll try to nail down everything related to 2n5415: its main features, working, and applications. Let’s dive in and explore the nitty-gritty of this electronic component. 2n5415 is a PNP transistor that is mainly used for general purpose low-power amplifying and switching applications. It operates on a general amplification principle where small current at one terminal is used to control large current at other two terminals. 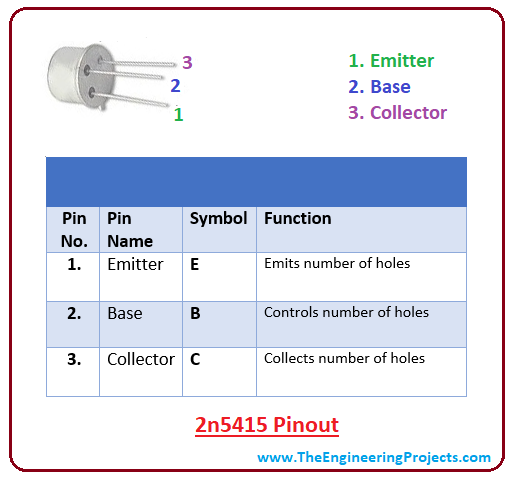 The 2n5415 is incorporated with three terminals known as an emitter, base, and collector which are used for external connection with the electronic circuits. These terminals are different in terms of doping concentration and size where a base is lightly doped and is responsible for the transistor action as it controls the number of holes flowing from emitter to collector. The emitter is highly doped and contains 100% transistor current which then distributes between base and collector. The collector terminal is moderately doped and comes in a bigger size as compared to the other two terminals. It is mainly used to collect the holes emitted from the base terminal. As the voltage is applied at the base terminal, it gets biased and starts drawing little current which plays a vital role to control large current at the emitter and collector terminals. The base terminal voltage has a large influence on the output current obtained at the collector terminal. This process is used for amplification purpose. The PNP transistor is a current controlled device, also known as sinking device, where it sinks current into its base terminal and current flows out of the collector. Following figure shows the pinout of 2n5415. Holes control the conductivity in this PNP transistor similar to electrons that control the conductivity in NPN transistors. In PNP transistor base is more negative as compared to emitter and collector. Following figure shows the circuit diagram of 2n5415. As mentioned earlier, the emitter terminal is highly doped and comes with 100% transistor current i.e. 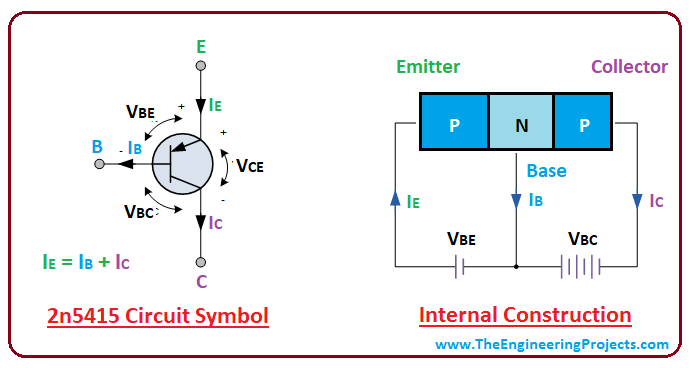 emitter current is a sum of current at collector and base terminals. When the voltage is applied, holes are diffused through the base from the emitter in this PNP transistor which eventually collected by the collector. Most of the professionals prefer NPN transistor over PNP transistor for amplification purpose because they consider conduction carried out by the movement of electrons is more effective and suitable than conduction carried out by the movement of holes. Following figure shows the absolute maximum ratings of 2n5415. 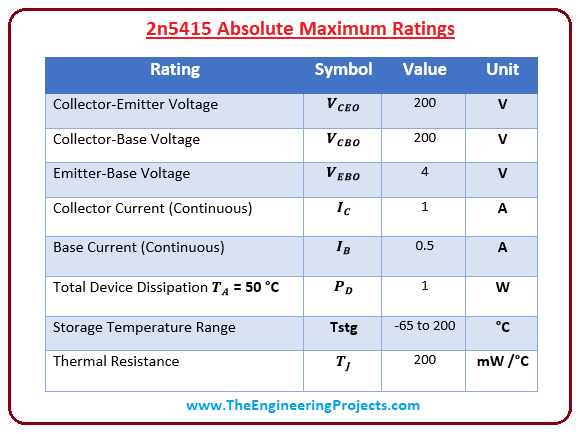 These are the stress ratings which directly affect the execution of electronic circuit. If these stress ratings are exceeded from absolute maximum ratings, they can damage the device at large, ultimately affecting the overall nature and performance of the project. Similarly, if these ratings are applied for the maximum period of time above normal operating conditions they can affect the reliability of the device. It is preferred to examine these ratings before placing the device in the circuit and make sure the device follows the same stress ratings as defined by the manufacturer. It is widely used in general purpose low-power amplifying circuits. Many switching applications are incorporated with this transistor. That’s all for now. I hope I have given you valuable information regarding this PNP transistor. If you are unsure or have any question, you can ask me in the comment section below. I’d love to help you in any way I can. You are most welcome to keep us updated with your valuable feedback and suggestions, so we keep producing quality content and you keep coming back for what we have to offer. Thanks for reading the article.